It’s 2012 and you’ve decided you’ve decided that this is the year you are going to start writing a blog or even take an old blog out of hibernation. At this stage I’m writing based on my experience as a student teacher developing a social media presence but really I imagine a lot of this advice will be easily transferable to classroom blogs or teachers looking to develop a social media presence. Before you even start blogging think about why it is you want to start a blog. You might have several reasons for blogging both for yourself and for your students but ideally you should be able to articulate in 140 characters what your blog is about. The content on your blog largely needs to stick to the purpose and theme of your blog. There’s lots of blogging platforms out there so have a look around and decide what you think might meet your needs. I’ve made no secret that I am an avid wordpress user however for my class blog I ended up back at blogger as my school uses google apps. Seeing as the kids already have google accounts it didn’t make much sense for me to use wordpress as a platform for the classroom blog even though I loathe blogger with the fire of a thousand suns. Above anything else the content on your blog should be easily readable for incoming visitors. Colours and fonts are important but you also need to think about what visuals you use, how you organize your content and how users can share your content. Background images can add to your blogs visual appeal but can also be distracting. Likewise a well-designed header will draw readers into your content while a poorly designed one will have readers wondering where your content is. Widgets can add personality to your blog but too many can be distracting for the reader. Finding a readership for your blog is just as important as writing good content. Start by posting blog updates to your facebook profile or tweeting new posts. In fact sign up to Twitterfeed which can publish blog updates to your facebook and twitter accounts the minute you hit publish (you can even configure the updates to include hashtags after your post title). 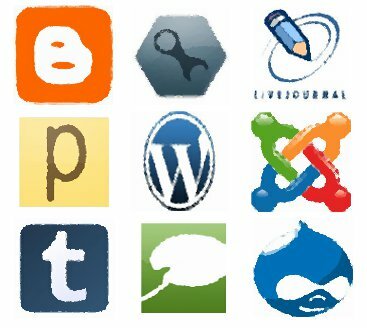 Most blogging services these days have buttons for users to tweet, facebook, email and distribute your writing far and wide. You should also have links to your twitter profile and RSS feed for people to start following your work. Writing content is just one part of the blogging equation managing it is just as important. Think about your post titles are they something that someone would type into a search engine? You also need to think about when and how frequently you publish posts. Decide your posting schedule and stick to it. The whole point of blogs is that they need to be regularly updated in order to engage readership. A lot of newbie bloggers think that you need to post content the minute you’ve finished the post and pound out several post in quick succession and then nothing for months. Unless you are posting on something time-sensitive then you can keep content up your sleeve for when you are busy in real life (in fact I’m currently writing this post on boxing day because I’m bored of watching cricket). I’m not going to lie after the inital euphoria of ‘ZOMG I have a blog!’ passes you get into the dull drudgery of actually writing content on a semi regular basis. For the first few months it can be disheartening when you feel like you are writing awesome stuff but nobody seems to be reading or commenting or your work. The green-eyed monster can also rear its head when see other more established blogs getting lots of comments and plenty of retweets while you are quietly toiling away and nobody is noticing. But blogging is a bit like keeping fit, you’ve got to do a little bit of exercise each day over a long time rather than spending 3 hours at the gym sporadically to see results. At this table demonstrates that it took almost six months to build up an engaged audience for this blog. Hi Stephanie, I am a studying education at the University of New England in Australia and stumbled across your blog courtesy of a google search for ‘teachable moments’. While I won’t be referencing your flight to Wellington in my Uni assignments, you can now add me to your list of faithful readers. I’ve just spent a good chunk of my evening reading through some of your experiences, with equal amounts of excitement and trepidation for what lays ahead!